communication-content to its customers in a previously unknown and unique way. biosynthetic that is completely biodegradable within normal biological cycles. which the addressee then sows and marvels at its growth. and sustainability, aiming right at the emotional world of the consumer. standard with the social leitmotif of sustainability. 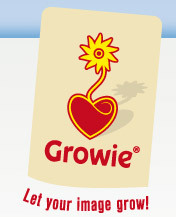 Do get to know Growie® discover its versatility and use its strength for your company communication.